In the year 1998, when Atal Bihari Vajpayee was heading the BJP government at the Centre, he took a major decision that rocked India and the world — especially the neighbouring Pakistan. Vajpayee ordered nuclear weapons tests, commonly referred to as Pokhran II, stoking fears of an atomic war with Pakistan as the latter too tested its nuclear power the same year. Months later, Vajpayee launched a groundbreaking peace process with Islamabad, proving he did not want a nuclear war, though he did want India to be nuclear-armed. And despite all the previous animosity, Vajpayee charmed Pakistan during his trip to the country. In February 1999, he started the famous bus service between Delhi and Lahore, and rode the bus to Pakistan on its inaugural run on 19 February, for a trip that remains memorable for many reasons. That Vajpayee had charmed all during his stay in Pakistan has been well documented over the years since the trip. It was during this tour that his then Pakistani counterpart Nawaz Sharief had famously said Vajpayee could even win an election in that country. Vajpayee was accompanied by 22 distinguished Indians including journalist Kuldeep Nayar, dancer Mallika Sarabhai and film personalities like Dev Anand and Javed Akhtar. The bus was to run daily from Delhi to Lahore and back. Vajpayee aide Sudheendra Kulkarni had later recalled what the then Pakistani information minister Mushahid Hussain had said about the Indian PM during the trip. “Vajpayeeji has real guts to come to Pakistan like this and at this time,” Kulkarni had been later quoted as saying. Vajpayee charmed Pakistan in his usual style – with his poetry, with his prose and with his oratory. 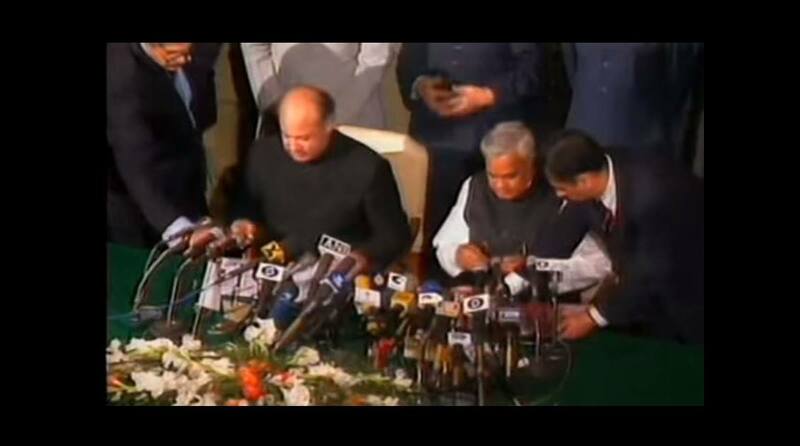 The two leaders signed Lahore Declaration, a bilateral agreement and governance treaty between the two nations, on 21 February 1999 ending the historic trip on a high note of hope for peace. Under the terms of the treaty ratified by the parliaments of both countries, a mutual understanding was reached to avoid accidental and unauthorised operational use of nuclear weapons. The Lahore Declaration was a major breakthrough in forging new relations between India and Pakistan, though the Kargil war of May 1999 poured water on all the efforts. However, not all was lost yet. In 2004, Vajpayee was in Pakistan again, this time to take part in the SAARC Summit held in Islamabad. The then Pakistani finance minister Shaukat Aziz was attached to the Indian PM during his stay there. And the Pakistani lawmaker was bowled over by Vajpayee’s “good sense of humour”. “He is quite observant. He noticed all the banners and also used one of the slogans in his speech. He was very happy, (and) he left Pakistan in a good mood,” Aziz had said after the summit. Aziz said they watched the India-Australia cricket match together on television in the hotel Vajpayee stayed in, and also recalled the BJP leader’s fondness for music. Vajyapee would carry a compact disc player and play music whenever he travelled in car. And in reply to a question, the PM told Aziz he chose the CDs himself. Together, they listened to old Hindi sings of Lata Mangeshkar. “I gifted him CDs of Noor Jehan, Nusrat Fateh Ali, Mehdi Hasan, Ghulam Ali, Nayyara Noor, Farida Khanum and Iqbal Bano,” Aziz had said in 2004, adding Vajpayee gave his book “21 Poems”, translations of his poems in Hindi, to him in return. The year 2004 was the same year when Indian cricket team made the historic tour of Pakistan where they played a 3-match Test series and a five-match ODI series. An Indian cricket team was travelling to Pakistan after 19 years. Around 20,000 visas were reportedly granted for Indian fans to witness their team play in Pakistan. The Indian team obliged. They won both the series, and the bonhomie they shared during the trip is spoken of till date. After receiving news of Vajpayee’s death on Thursday, several Pakistani nationals tweeted to express grief, recalling the efforts he had taken to establish peace between the two ever warring nations.